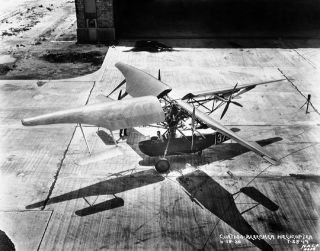 The Curtiss Bleeker Helicopter, one of the first helicopter prototypes at Langley. In this historical photo from the U.S. space agency in June of 1930, this Curtiss Bleeker Helicopter was photographed on the tarmac in front of the Langley hangar. The first successful helicopters, however, appeared in Europe later in the decade.